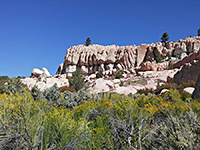 Spring Valley is one of the more remote state parks in Nevada, away from major travel routes, in the far east of the state 18 miles from Pioche and US 93. 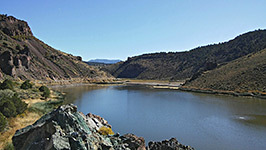 The main feature is the 60 acre Eagle Valley Reservoir, a 2/3 mile long lake formed in 1965 by construction of a dam across Meadow Valley Wash, popular for fishing (primarily for rainbow trout) and boating, while other attractions include several historic ranch buildings and a 1.3 mile trail across some shallow canyons with eroded volcanic rock formations. 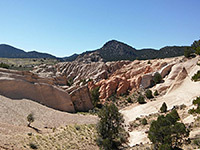 The park is pleasantly scenic without being outstanding; upstream of the reservoir, which is quite narrow and bordered by steep slopes, the valley becomes larger, its flat floor up to half a mile wide and filled with long grass, and the predominantly grey, partly wooded slopes at either side are enlivened by patches of lighter-colored volcanic tuff, eroded into little fins and gullies, so the landscape is quite photogenic and the place has more to offer than is often the case for parks where the main attraction is a lake or reservoir. 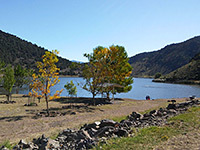 Other facilities include a visitor center, boat launch, picnic/day-use area and two campgrounds. 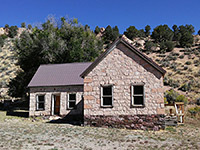 The 18 mile drive to the park from Pioche is along paved Hwy 322, initially across an wide plain, then over a low ridge and down towards the shallow canyon of Meadow Valley Wash, here known as Eagle Valley. Downstream, this leads to similarly small preserve with a reservoir (Echo Canyon State Park) then, after passing close to Cathedral Gorge, enters a longer canyon containing another state park, Kershaw-Ryan. The main road however goes upstream, where the valley becomes briefly wide but soon narrows, and the paved section of the route ends beside the dam forming Eagle Valley Reservoir, at the entrance to Spring Valley State Park. Near here is the day-use area, the boat launch ramp and pier, and Horsethief Gulch Campground, which has 37 sites, and can accommodate RVs up to 35 feet in length. An unpaved road proceeds along the north shore of the reservoir and the edge of the marshy grassland beyond, past two stone buildings to the park headquarters, contained within another historic structure, Millet Ranch one of several former settlements in the valley; the first was established here by Mormon pioneers in 1864. The smaller (seven site) and more primitive Ranch Campground is just beyond, after which the road continues northwards, exits the park and leads through increasingly remote terrain. 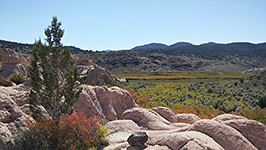 The one hiking path in the park is the 1.3 mile Stone Cabin Trail, which starts in the south at a pull-out along the road and ends in the north at the Ranch Campground. A 2.2 mile loop can be made by walking back along the road. 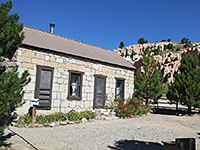 The southern trailhead is at Stone Cabin, one of the three largest ranch buildings in the park; a well-preserved and partly restored structure enclosed by a small, fenced, tree-lined garden, beside which are an old pioneer wagon and several pieces of agricultural machinery. The path starts off northwest across a wooded flat, before climbing about 300 feet up more open slopes where the white or pinkish volcanic rocks are prominently exposed, then descends to the upper end of a small valley with more outcrops, followed by a longer traverse of grassy, sparsely wooded slopes. 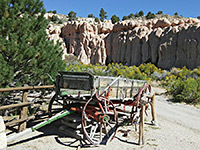 It drops down to a wider ravine, rises once more and enters the short, cliff-lined canyon that contains the Ranch Campground. The last part of the route has good views eastwards across the main valley, here centered on a distinctive, isolated white outcrop surrounded by grassland, known as George Washington Rock.